Illicit Nightclub in a Chelsea Water Tower – NYTimes.com. I just love this concept. Nearly every touring musician has at least one story about load-in or breakdown gone awry — that emotionally scarring gig where the venue promised a full drum kit but only delivered a broken snare drum, the festival slot when you expected fifteen minutes to set up but only got fifteen seconds, or that sickening post-gig moment when you realized your vintage Les Paul had grown legs and walked out of the club, all by itself. Can such situations be prevented? Quite often, yes, and adopting common-sense habits like showing up early, making lists, and packing ahead of time can save you considerable trouble and grief before and after you hit the stage for your music gig. Beyond that, many players develop their own sets of best practices through hard-earned, on-the-gig experience. Here are tips from bassist Tony Tino, guitarist Laurence Yeung, keyboardist Arlan Schierbaum, and drummer Josh Giunta to help you maximize your effectiveness and minimize your stress when setting up before and breaking down after a gig. Many venues will have some eclectic variety of house gear available for your backline. 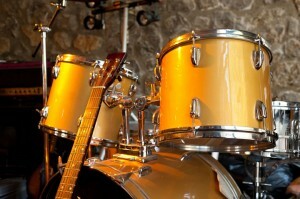 Drum kits and amps, in widely varying conditions, are among the most common pieces of backline equipment you’ll find. A quick look online, or call to the venue or your bandleader, can usually tell you what to expect. If you’re using house equipment, though, know that whether it’s a keyboard, microphone, or guitar amp, it probably has seen lots of use and abuse – so adjust your expectations accordingly. Depending on your instrument, the specifics may vary, but the theme remains the same: bring all of the non-instrumental bits and pieces that will make your instrumental work go off flawlessly. Schierbaum recommends dark-colored power strips and black extension cords for electricity, extra audio and speaker cables in case something fails unexpectedly, and bags for pedals, cables, mics, tuners, and other things. Packing a music stand doesn’t hurt either, in case there’s nowhere convenient to put your chord charts or set list. Regardless of the instrument, having your equipment ready right out of the case will make a huge difference when it comes time for the first downbeat. First and foremost, this means making sure your instruments are in tune and that your gear works, says Tino. If you haven’t used a particular piece of equipment recently, test it out at home prior to the gig — you don’t want to discover on the bandstand that your signature vintage overdrive pedal has a short circuit and can only deliver a noisy fart instead of a raging growl. For keyboardists, instrument preparations often mean having all your sounds programmed into easy-to-find soundbanks, so you don’t have to waste precious minutes searching and tweaking. Taping a cheat sheet with song-specific patch location information to your keyboard can be helpful. Tiny stages can be tricky, and it’s probably not the best thing if you’re packed in so tightly that your trombonist brains your drummer every time he slides out for a low note. While many spacing issues get worked out on the fly as everyone’s setting up, it can be useful to know what you’re dealing with ahead of time, so you can nip major problems in the bud. If you aren’t able to visit a venue ahead of time, clubs often have stage diagrams or photos of the performance area available online. Reaching out to musician colleagues who have played a given space before can also give you what you need. In the dim lights of a rock club, all patch cables can look the same, so it never hurts to label yours with a distinctive color of tape. Similarly, if the band after you has a keyboardist with the exact same Nord Electro as yours, some sort of ID tag or marking on the instrument and case can help prevent unfortunate mix-ups. If you’re travelling to gigs via car or van, Tino further recommends staying mindful of the weather, and not keeping any sensitive gear inside the vehicle if the temperature is trending extremely hot or cold; he also advises to keep any potentially valuable piece of musical equipment locked in a trunk or otherwise well out of sight. Certain gear requires additional precautions, Schierbaum points out. “If a tube amp is hot from a show and goes directly outside into freezing temperatures, the tubes can fracture from the cold,” he says. “Most bands don’t have roadies, so after you’ve taken care of your own gear, help with someone else’s,” adds Yeung. Tino agrees, also advising that, if there’s a band on after you, help them with their equipment as well, if need be. The music world can be surprisingly small, and you never know when a minor kindness rendered to the band going on after you can pay you back in unexpectedly cool ways. Regardless of whether or not another act is nipping at his heels, Schierbaum always likes to break down right away before hanging out with friends, fans, and bandmates. “That way my equipment is organized, safe, and ready for load out,” he says. If possible, visit the venue you’re playing in advance and catch another band’s show. Watching other acts load in, set up, play, and break down will tell you a great deal about what to watch out for when it’s your own turn. If you’re hauling lots of gear, also pay attention to the entrances and exits, staircases, and pathways to and from the stage. If you have to haul your Marshall stack up three flights of stairs and push it through a café space full of cramped tables, you may want to leave a little extra time for setup and bring a sturdy dolly — or opt for a completely different rig. Excerpt from our guide, Touring As An Indie: Strategies for booking, promoting, and thriving on the road. Our collection of posts and articles on touring can help you make the most of life on the road. Michael Gallant plays eclectic indie rock with Aurical and progressive jazz with the Michael Gallant Trio. He is also the founder and CEO of Gallant Music, a content and music creation firm based out of New York City. For more, visit auricalmusic.com and gallantmusic.com. Follow him on Twitter at @Michael_Gallant.